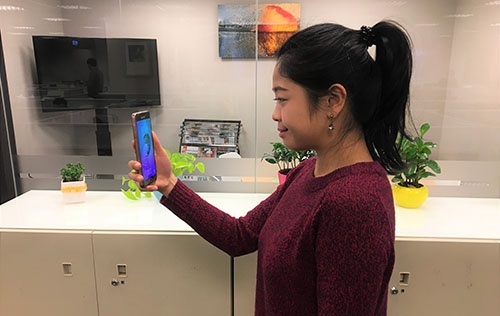 Jan 10, 2018 — Kneron, a leading provider of edge Artificial Intelligence (AI) solutions, today launched its Real Facial Recognition solutions to unlock entry level and mid-range smartphones. As long as a smartphone has a front camera1, through Kneron’s facial recognition software with deep learning technology, it can not only accurately recognize people’s facial features, but also determine whether the face is real or not. It can rule out the risk of using photos and videos to unlock a smartphone within 0.2 seconds, with less than 0.0001 error rate2. Additionally, one device can recognize several faces. Kneron’s Real Facial Recognition solutions have been adopted by smartphone manufacturers and will be marketed worldwide through its partner GMobi. Kneron Real Facial Recognition solutions integrate sophisticated facial recognition and deep learning technologies, which can recognize a real face within 0.2 seconds, with less than 0.0001 error rate. Additionally, one device can recognize several faces. Kneron Real Facial Recognition solutions include three technical versions: optical sensing analysis, biological behavior recognition, and background depth detection. Optical sensing analysis can determine whether a face is three-dimensional through analyzing the lighting variations on the face; biological behavior recognition integrates behavioral detection, such as eye blinking, to determine whether a face is real; the background depth detection solution can be used if there is an autofocus function in smartphone’s front camera. It can analyze the scene depth of field to avoid unlocking by a two-dimensional image. 1Front camera is suggested to support higher than 1 MP resolution. 2Measured results will vary according to the smartphone hardware specifications.